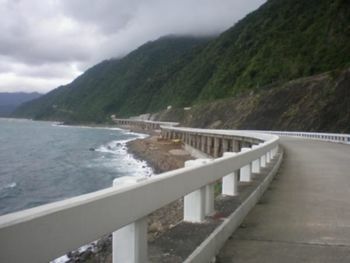 Pagudpud a 1st class municipality and a coastal resort town on the northernmost tip of Luzon in the Philippines. The town is bounded to the south by the town of Bangui and to the east by the Cordillera Mountain Range, the town of Adams and the province of Cagayan. The South China Sea lies to the west and north. The town rolls over mountains, hills, valleys and flat coastal land. It lies 45 miles (72 km) north of Laoag City, the provincial capital, and about 350 miles (560 km) north of Manila. They reside in 3,804 homes that are spread across 83 square miles (210 km2). Most make their living through farming, fishing and subsistence retailing. Tourism is a growing part of the economy. Its white-sand beaches and crystal-blue water makes Pagudpud a haven for tourists. Maira-Ira Point is also an emerging attraction with its secluded beach known as the Blue Lagoon. Access to this public beach is from a secondary concrete road on the north side of the Maharlika Highway just before approaching the Patapat Viaduct. On the way to the Blue Lagoon, a sea arch can be seen. Coconut trees line much of the town's coast. On a clear day, the Babuyan Islands are visible from Patapat National Park. It is a hidden bay found at Maira-ira Point, which is a half-moon in shape edifice, by the Nacatnagan Cliff in the east and the Dos Hermanos in the north. This place is where you can escape the hustle and bustle of city life. Reaching the place is quite tiresome for it is around 2.5 kilometers away from the highway with rigged roads and it is found at the interior part of Sitio Malingay. On the way is thick forest and you can also have glance of the sea. Malingay Cove is famous for its crystal blue water and fine white sand. 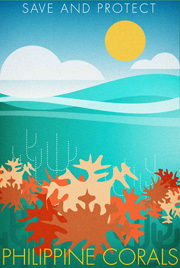 Below the rocks are caves where varied and colorful tropical fishes swim abundantly that can be seen during low tides. Around Dos Hermanos Rocks submerged smaller rocks where famous delicious seaweeds "gamet" are taken. edit Kabigan Falls. It is an enchanting falls located at the eastern part of Barangay Balaoi and it is around 1.8 kilometers away from the national highway. This 80 feet waterfall is surrounded by thick forest and well-known for its concaved basin. edit Saguigui Falls. It is a small waterfall situated at Barangay Balaoi, 3.5 kilometers away from the national highway. This falls is not yet popular for the reason that it is not easy to get there. You can fly into Laoag City via Cebu Pacific or Philippine Airlines and then take a two hour bus (P60), jeepney or taxi ride into Pagudpud. There are currently two bus companies that make the trip Manila - Pagudpud in around 12 hours. They offer night trips, standard air-conditioned and deluxe sleeper buses with built-in toilet. GV Florida Transport, Sampaloc, Manila. Standard Air-con Manila-Pagudpud, P650. Alternatively, you can take one of the more frequent buses heading to Laoag and then change into a local bus (P60, every 30 minutes) for two hours.